How do you manage to keep track of your monthly numbers? I am so impressed but baffled how you keep with all these things! I love that you also live in the DFW area as I'm in Garland. 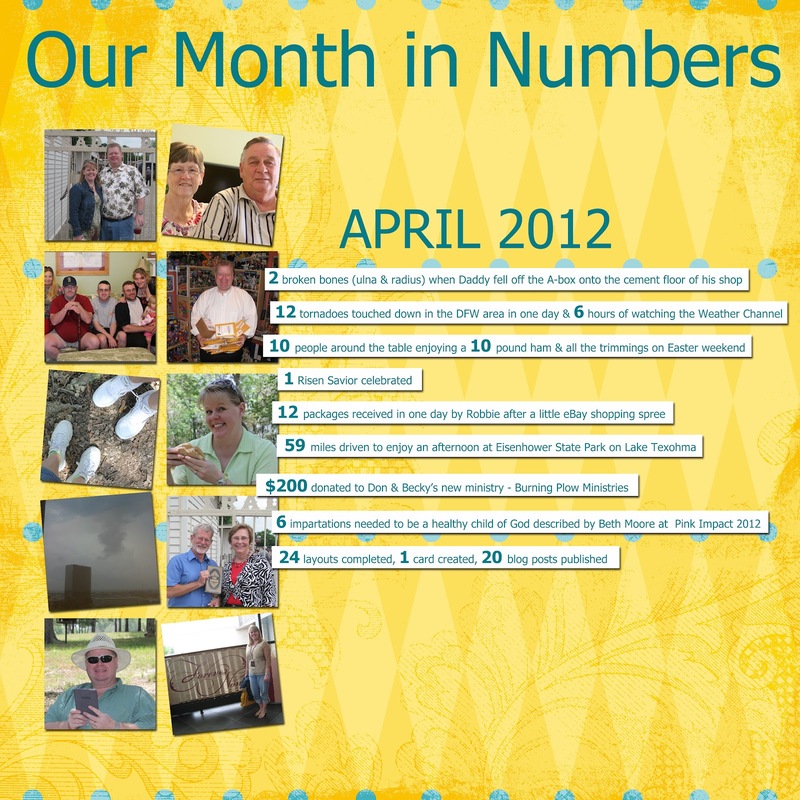 You really rocked the layouts in April! This is the first month I didn't make (and exceed) my Twelve, but will be making up for it in May - I'm in LOAD again! I love your month in numbers. Such a great idea. 24 layouts! You are rolling. Great job. 10 people round the table for a 10lb ham sounds like a wonderful way to celebrate Easter! I need you to come inspire me to actually do layouts this summer! hope your dad is mending well :) How was Pink Impact? Wow, you had quite an eventful month! Hope your Dad is doing okay. My oh my, what a busy month. I learned all about what you were up to and a new word "impartations" as well. I off to look it up. That's quite an exciting (not necessarily in a good way) month! Hope your dad is recovering well.